We took our seats on the boat and headed for Malaysia. The boat ride only took about one hour. Although the island is Malaysian territory, it is closer in geography to Thailand. We were both really looking forward to Langkawi and were both just happy to be backpacking again. We arrived into Kuah jetty late in the afternoon. Our arrival was the antipathy of our departure from Thailand. It was friendly, quick and easy. We were stamped with a 90 day visa (we double checked!!!) 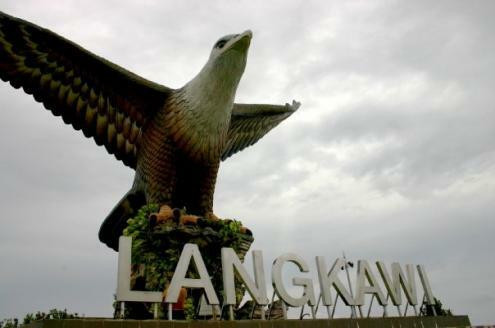 and we walked out to a pier of smiling faces looking over the great Langkawi eagle that perches imperiously over the port. I felt immedietly that I was in a different country and one that played by different rules. A taxi took us to the other side of the island for 24 Ringits (£5.00 roughly); to find accommodation at Pantai Cenang. After the taxi dropped us off at the top of the main road we took the first path leading away from the beach to find some cheap guesthouses. We checked into a place called Daddy's Guesthouse, which was really cheap at around £4.50 per night. It was perhaps closer in appearance to a Manhattan crack den than a Malaysian Guesthouse but the price kept us there a whole 5 nights. During our stay we have visited the Seven Wells Waterfall, The Langkawi Cable Car and suspension bridge, as well as Underwater World. Lisa also celebrated her 27th Birthday, enjoying a great day at the waterfall surrounded by Monkeys, taking photographs and admiring the views from the top. The rest of the evening was spent at the Yellow Cafe where we relaxed with a few beers and watched the sun set on the beach. Lisa also got a lovely ring and a new dress that she looks amazing in as presents to go with her new leather bag. Langkawi has some spectacular scenery and some great beaches. However, probably 2 or 3 days here is enough to do and see everything. The weather was a little unpredictable during our stay which meant we had to stay a little longer than anticipated just to see everything. The Cable Car is a must for anyone going to Langkawi. The journey to the top takes about 15-20 minutes and the views from the summit are what it's all about! The Cable Car also has the longest vertical drop from the ground and boasts the highest single wire suspension bridge in the world. The beach is lovely and if you like watersports then this place is close to being heaven. However, there wasn't enough to keep us entertained much longer and so we want to move on now. Catching a ferry south to the island of Penang.